The Results Are In – Healing Never Tasted This Good! An independent taste test conducted on November 8, 2016 revealed that over 70% of participants preferred the taste of ProHeal™ Liquid Protein when compared to the leading brand. The blind taste test comparison occurred on 11/8/16 in a dining room of a post-acute care setting using a sample of convenience that included 20 residents and 5 staff members. The residents were from assisted living, long-term care and rehabilitation. 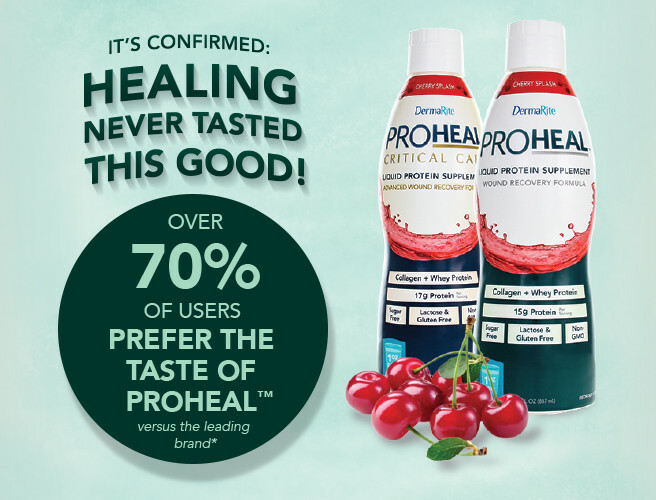 All participants were informed of the taste trial for the 2 cherry flavored products (ProHeal™ and ProStat SF®). No food allergies were reported. The facility’s staff conducted the trial and no manufacturer representative was present during the taste test. The samples were unlabeled and the identities of the products were known only to the testers. The subjects reported their preference based on taste after sampling both products. Staff reported preference (n=5): Prostat=1 (20%); ProHeal=4 (80%). Residents reported preference (n=20): Prostat=5 (25%); ProHeal=14 (70%); no preference=1 (5%). Statistical analysis using one sample t-test between the percents shows a statistically significant (p=.031) difference in test preference in favor of ProHeal. Cumulative staff & residents (n=25): Prostat=6 (24%); ProHeal=18 (72%); no preference=1 (4%). Statistical analysis using one sample t-test between the percents shows a statistically significant (p=.010) difference in test preference in favor of ProHeal.